on February 12, 2019, 11:23 a.m.
Valentine’s Day (14th February), which marks the celebration of romantic love in many regions around the world, is almost here. But new YouGov research shows that while 99% of Hong Kongers are aware of it, only half (52%) will be marking it – and the longer people have been in relationships the less likely they are to do anything. Hong Kongers currently in a relationship are most likely to celebrate Valentine’s Day, with three quarters (77%) intending to do something special. This is in contrast to married Hong Kongers – where six in ten (60%) will. 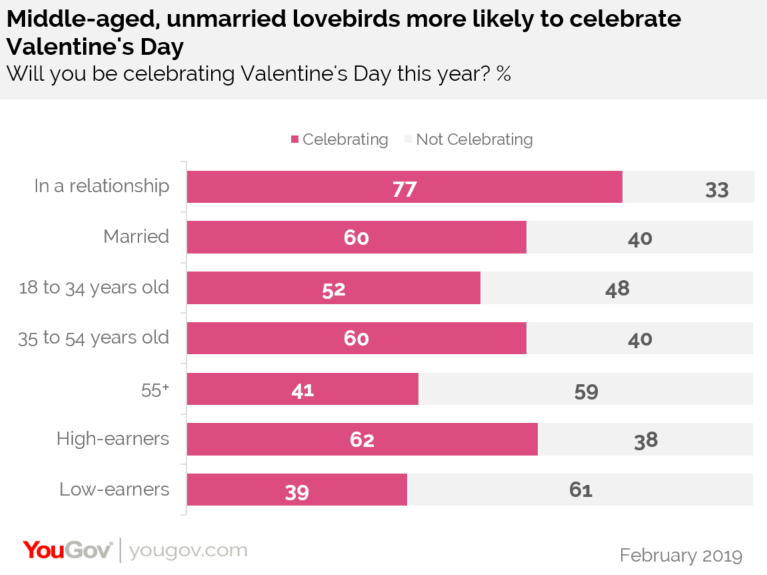 Valentine’s Day is most popular amongst those aged 35 to 54, with six in ten (60%) celebrating compared to half (52%) of those aged 18 to 34, and four in ten (41%) of those aged 55 and over. The date also appears more popular amongst higher earning Hong Kongers (those earning more than HKD 50,000 a month) than lower earners (earning less than HKD 25,000 a month). While six in ten (62%) of high earners will be celebrating, this drops to four in ten (39%) amongst low earners. Whether someone marks Valentine’s Day also depends on how long they have been with their significant other. 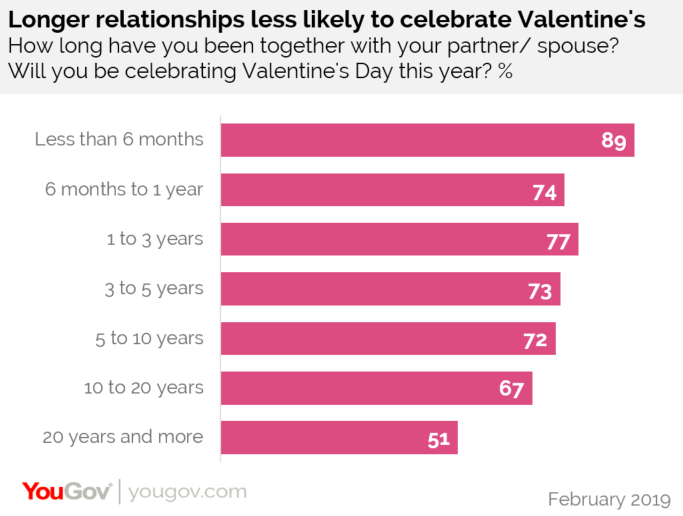 While nine in ten (89%) of those who have been with their partner for less than six months will be celebrating, this drops to seven in (72%) who’ve been together for 5 to 10 years. This drops further (to 51%) for people who’ve been together for 20 years or more. For those who will be celebrating, eight in ten (79%) will give a gift. On average, Hong Kongers will spend HKD 3,099 on a present, with the most paying via credit card (75%), followed by cash (20%) and debit card (4%). For 1% of Hong Kongers, their gift will be something that doesn’t cost money. Among the other half (48%) of Hong Kongers that won’t be celebrating, the top reason for not doing so is that they find it too commercialised (45%). Other popular reasons are that things are more expensive on Valentine’s (37%) and they don’t have a partner to celebrate with (33%).